Thirty years in the future, the world has gone to pot. Nearly everyone escapes their bleak, horrible lives by playing a virtual reality game called OASIS. When the creator of OASIS dies, he leaves behind a hidden "Easter Egg" in the game. Whoever finds it first will inherit his vast wealth as well as ultimate power within the game. With nothing left to lose, orphaned high school student Wade Watts makes it his life's mission to find the Egg. 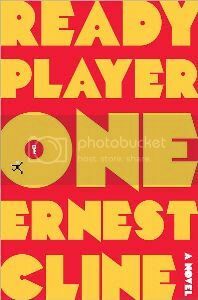 I'm not going to give Ready Player One a super-long review, as it's a pretty popular book and there are already lots of reviews out there. It was a fun story and I read it very quickly (usually my gauge of how much I like a book). However, the name-dropping of geek stuff like games and movies as well as the crazy amount of exposition was almost too much for me. In the virtual reality of OASIS, nearly every entertainment property of the last forty years has an equivalent "world" within the game. So characters can go to a Blade Runner planet, fight a bad guy from Ultraman or fly around in a Star Wars X-wing. Since every single thing in OASIS comes from somewhere else you can see where the name-dropping might get out of hand, and of course every mention of a giant robot or starship has to also mention the TV show or movie where it originated. With all this, it often felt as though the author were trying to squeeze in mentions of every movie/tv show/game/book/etc. he loved growing up, even when it wasn't relevant to the plot. All the detail on the things in OASIS as well as explanations about how stuff works in the "real world" resulted in a lot of exposition. While I can see that some explaining would be necessary for a sci-fi book like this, there was often so much of it that by the time the main character finished monologuing and got back to the plot, I had completely forgotten what was going on. Despite all that, I still really enjoyed Ready Player One. I'd recommend it to anyone who loves geeky stuff as well as 1980's-era entertainment (most of what is name-dropped is from that time period). Though at its current Kindle price of $11.99, it's not cheap. I'd suggest waiting a few months until that (hopefully) drops or else checking it out from your local library.